That is the most offensive book title I have ever seen, said my child when the review copy of French Kids Eat Everything arrived in the post: I mean, it’s putting down all kids who aren’t French. Hmm I thought I can see where you’re coming from, but then again you do regard pasta with pesto as highly exotic. 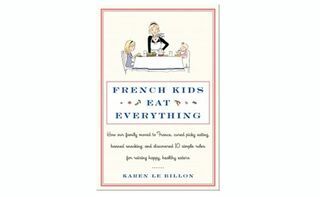 Part memoir, part cook book, part nutritional rallying cry French Kids Eat Everything: How our family moved to France, cured picky eating, banned snacking and discovered 10 simple rules for raising happy, healthy eaters by Karen Le Billon is a feast for the mind in many ways. We’re off to this place in France in the summer, and given that neither of my kids are what you might call culinarily adventurous, I was interested to read this book for ideas on what to expect, and pick up some pointers we could apply at home. French Kids Eat Everything traces Le Billon’s family, who moved from Vancouver to spend a year in France and in doing so found their eating habits transformed. In contrast to Le Billon’s children, French children seem to happily tuck into a huge variety of food. The author researches how this comes to be and how she can apply it to her own picky eaters. A big stumbling block seems to be Le Billon herself, who freely admits that she’s a reluctant cook with fairly narrow tastes and a hardened attachment to snacking. Le Billon distills what she learns from French ways into 10 rules, though some of this will seem like common sense rather than a uniquely French approach. What makes this book stand out is the way in which it shows Le Billon attempting to apply these rules to her own family, a journey which is often far from plain sailing. She’s a mother who has struggled like a lot of us, and is sharing the lessons this has taught her. Controversially, part of the French way involves the attitude that it’s OK for kids to be hungry sometimes, with even little babies left waiting for the next scheduled milk stop. There’s absolutely no snacking, no eating on the run or in the car – French parents would be horrified at the way most UK parents carry a snack on every school run. I liked this book very much and found it to be a fascinating, engaging and thought-provoking read. I don’t think it’s just one for parents of picky eaters – anyone who has an interest in children’s nutrition will find it worth reading. And anyone whose child has erupted in the face of something green on their plate will find this an invaluable source of ideas for a new approach. I’m delighted to be able to share this fascinating book with you. I have one copy of French Kids Eat Everything to give away. To enter, leave a comment below saying what was your favourite food as a child. Closing date: Midnight on Monday 21st May. Optional extra entry if you like this blog on Facebook – state in your comment if you’re claiming an extra entry. I will pick a winner at random after the closing date and post the book to them as soon as possible after that. No regional restrictions, will post the prize anywhere in the world. Though if you’re in France you probably don’t need it. When I was little my parents had routines they’d got from theirs – so Tuesday was ballet lesson with a peanut butter sandwich beforehand, and “Andy Pandy’s favourite meal” (fish fingers and chips, I think it was a ploy to make me eat it) for my tea. Much to my parents amusement my absolute favourite food as a child was scallops. I could tell if they weren’t fresh. I recall ordering them, age 5, at a Greek restaurant, chargrilled with garlic and chilli. My dad’s mouth was watering as he “knew” I wouldn’t manage them. I recall him being most miffed I demolished the lot! Ooh, I’m just reading French Children Don’t Throw Food – they’d probably be good companions! My favourite food as a child was probably cheese sandwiches, still might be actually! My favourite food was plain pasta with tomato ketchup. It was a special treat! Oh, and I already like you on Facebook, so I’d like my extra entry please. My favourite food as a child was dhalpourie roti (I’m from Trinidad) and it’s still my favourite today! Now we just need to get the rest of the children eating everything. My favorite food as a child was watermelon. I could eat it until I was sick, but I never was. Lentil soup was my favourite would you believe! My favourite food was fish fingers and spaghetti hoops. My favourite food as a kid was sausages and mash potato, and it still is now! i loved pasta and pizza! When I was a child, I ate only peanut butter sandwiches. Favourite food as a child was- strawberries and ice cream. I certainly remember loving calamares as a child, and my mum can’t resist reminding me that I loved spring onions & would eat them by the handful. I loved Heinz Sandwich Spread! Liked on Facebook. Homemade pizza – it was as fat as a cake and square. My mum put anything she could find in the fridge on it. Liked your blog on FB as Sally Sellwood; I happen to know it’s not true, btw – recently had a french child staying with us (and his definitely unfussy parents) and there was quite a lot of sensible food that he wouldn’t eat. My favourtie food as a child was egg in a cup: http://recipe-junkie.blogspot.co.uk/2012/03/perhaps-i-have-problem.html if you need to know what that is! As a child and born in East End of London, before we moved. It was my trip out with my Grandmother to have pie and mash with mushy peas in a local cafe. Just loved it. Great memories. My favorite food as a child??? Hmmm…. I liked almost everything we had EXCEPT pea soup. My parents have photos of some of us sleeping at the table with pea soup in front of us. We weren’t allowed to leave until we finished our food. Some childhood favorites: homemade pizza, tacos (back in the day when you needed to deep fry your own tortillas), sauerkraut & dumplings and ginger muffins. Mine was my mum’s homemade lasagne. Still love it now! my mum was a very old fashioned cook, i never grew up with things like pasta or rice. it was a very much a meat and 2 veg household. mum used to push the boat ut though at lunch times, i would have pitta bread with tomato sauce and cheese. My favourite food as a child was my mum’s Milk Potato Soup. You just poach potatoes in milk, season & that’s it. We used to drop in a blob of butter and watch it melt, and maybe add snipped chives or parsley from the garden. My favourite food was garlic sausage, until my dad told me it was made from piglets! Surprisingly, I enjoyed a variety of food ever since I was small. But then, in those days there wasn’t such a big variety available as now. We lived in a communist country where you were lucky to do a good shopping. The one thing I really didn’t like as a child was any kind of meat. Chicken and fish was the only thing I would go for. It changed once I got into my twenties. But I think a Russian “Cottage cheese gnocchi” would have been one of my favorites. Really enjoyed your post. Liked you on Facebook. My mum’s scones were my favourite. Fresh out of the oven with melting butter on them – delicious! My favourite food has always been Roast Chicken,currently I’m suffering with health problems (Possible Gallstones) and am on a strict low fat diet so can’t eat it. Have liked you on Facebook already. My absolute favourite food was yoghurt – with vanilla, sugar, sugar and cinnamon, undiluted squash, chocolate sauce or any variation going – this was until I discovered yoghurt ice-cream which was even better than yoghurt in the summer months! My favourite food as a child was cauliflower. I Used to love baked bean pizza when i was a child but you cant buy them anymore! i loved gammon. not so keen o it now though! Sugar and banana sandwiches – would not dream of giving that to a child but it was a long time ago!! erm ..I used to love cucumbers! Ate loads of them, sliced diced with dips on their own… (probably because I never liked drinking water) and I still like them now, my first interflora bouquet from a teen boyfriend was 11 cucumbers and a red rose! I already follow your blog on Facebook and would love an extra entry! Fish fingers and ketchup was a firm favourite. I once convinced the babysitter that that’s all i ate! My favourite food as a child was my nans chicken chasseur. I loved it. I also liked my dads cheesy beans on toast. You are liked on facebook too. I would eat pretty much anything – although Marmite sandwiches were my favourite. Detested Baked beans and any kind of offal – still do! My favourite food as a child was banana on toast – sometimes with little cubes of cheese on top?! I still love banana on toast, but never with cheese now. Liked on FB! Findus crispy pancakes, with a huge portion of spinach on the side. A delightful combo of deep friend tastiness and healthy veggies! My favorite one is the pop tarts. Up to now, It’s my addiction.